The past week has seen enormous and growing support for the Rossport 5. In a majority of Irish counties, Sinn Féin activists have turned out in great numbers, to picket oil distribution centres, Shell and Statoil petrol stations and to spread awareness with leaflets, petition signing and white line-pickets. Everywhere they have been warmly welcomed and supported. The Shell to Sea day of action, on Friday 15 July saw activities in support of the Rossport men in Wexford, Waterford, Clifden, Tuam, Ballinasloe, Loughrea, Galway City, Kilkenny, Athlone, Wicklow, Drogheda, Dundalk, Cork, Mountmellick in County Laois, and Ballaghdereen in Roscommon. In Belfast activists picketed the Shell Distribution Depot. On the Navan Road in Meath, Manorhamilton in Leitrim, in Limerick, and on the Sallins Road in Kildare, in Mayo itself, there was petition signing. A protest in Westport was attended by a large number of people. Sinn Féin TD Martin Ferris, congratulated the hundreds of Sinn Féin activists who joined and organised protests across the country. He said they made a significant contribution to the Shell to Sea campaign, in making people across the country aware of the outrageous shenanigans of Shell in collusion with the Fianna Fail/PD Government. Ferris went on to say: "Ninety-five percent of the people of this country are entirely opposed to the unjust imprisonment of these five small-holders from Mayo. It is outrageous that they are sent to prison for defending their right to live in safety, and their right to ownership of their lands, in face of a multinational corporate giant. The Government and judiciary have done nothing to defend these rights, only to perpetrate a scurrilous give-away of what is ours — the hydrocarbon resources in the Irish seas." In Dublin last Friday, over 20 Statoil stations were closed down by a broad range of activists, with a huge input from Sinn Féin who led or took part in almost all these simultaneous pickets to mark the day. People from many different parties took part as well as many individuals, independents and groups. Without exception picketers were met with loud support, from passing drivers, and passers by. The protests at Statoil were so widespread that Statoil Head Office sent guidelines to its franchise holders, on how to deal with the picketers. One Statoil station manager jumped the gun and arranged tea and biscuits for activists, who were largely drawn from Sinn Féin's new cumann in Kildare, chaired by Christin McAuley. The manager undertook to call up Statoil, to tell the Company how much business had been lost and request that Statoil take action to disassociate itself from Shell. The action has been taken to Norway where a paper of record has brought the issue to public attention. Sinn Féin MEPs have appealed to the Norwegian Government, in a letter which points out that Statoil is "part of a development (in Mayo) that would not be acceptable in Norway itself on environmental or safety grounds and that Statoil is to benefit from revenue and licensing terms that would not be permitted under Norway's own regulatory system." Earlier in the week a large number of campaigners protested at the McGill Summer School in Glenties, County Donegal, where Minister Dempsey was speaking on Managing the Future. Local Sinn Féin Councillor, Pearse Doherty, called on the Minister to suspend the current call for applications for new frontier licences, pending a review of the legislation and current terms and conditions under which licences are given. On Saturday the people of Mayo brought their campaign to Dublin city. 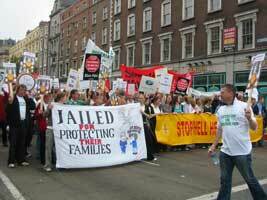 Several thousand protestors joined the demonstration through O'Connell Street, led by the families of the Rossport 5. Chaired by Jerry Cowley, Independent TD from Mayo, each of the families sincerely thanked all those who were supporting the Shell to Sea campaign. Sinn Féin President Gerry Adams, Party spokesperson on Agriculture, Martin Ferris TD and Arthur Morgan TD attended. Representatives from a wide number of interests and groups spoke, including the ICMSA, the ICSA, a representative from the Teachers' Union, ASTI, and even an ex-director of Statoil, the Resources Protection Campaign, a cross-party group which looks to defend national resources, and the SIPTU Offshore Committee. The long list of supporters is further evidence of the widespread support for the Shell to Sea campaign. Maura Harrington, spokesperson for Shell to Sea, gave a powerful address outside the GPO. Saying: "What happened here first at the GPO is being continued on today." She spoke of accusations that the Shell to Sea campaign is being hijacked by some political parties, "what concerns us is the absence of Fianna Fáil, Fine Gael and Labour. Where is Enda, where is Pat today?" She went on: "I'll be dammed if Ray Burke, and now Bertie, are going to continue to deny us what is ours, the gas."